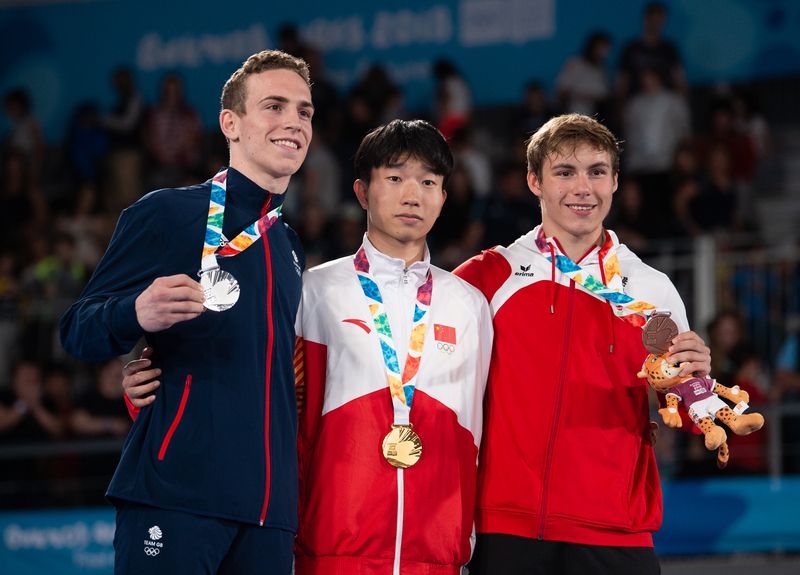 China have dominated Trampoline Gymnastics at this summer’s Youth Olympic Games (YOG) Buenos Aires 2018 by winning double gold. Sunday’s action kicked off with the women’s final, as Xinyi Fan carried on from where she left off in qualification. The 16-year-old cruised to the top of the leaderboard from the two preliminary routines earlier in the week and produced the best score of the final – 52.560 – to confirm the gold. Australia’s Jessica Pickering took silver with a score of 51.645 after a point deduction of -0.200, narrowly ahead of Vera Beliankina from Russia who claimed bronze. Completing a day to remember on the trampoline for China, Fantao Fu won the men’s Olympic title to secure their dominance. Finishing second after qualification, the 17-year-old took on what the judges considered to be the most difficult routine of the night in the final, executing well to finish with a score of 58.030. Also storming up the leaderboard, Great Britain’s Andrew Stamp scored 57.475 to secure silver after qualifying for the final in fifth. Austria’s Benny finished with 57.430 to take bronze. Buenos Aires 2018 is the third edition of the Summer Youth Olympic Games (YOG) to be held, bringing together the world’s best young athletes between the ages of 15 and 18. For the first time in Olympic history the Games will have gender equality, with equal numbers of males and females competing in the 32-sport programme. Almost 4,000 athletes from 206 National Olympic Committees will be competing for 1,250 medals. The Youth Olympic Games Buenos Aires 2018 feature new sports and many new disciplines and events, reflecting the passions of the ‘Game Changers’, a new generation of athletes and fans. The event offers a glimpse into the future of the Games as the new programme will introduce several innovations that will be replicated at the Olympic Games Tokyo2020. The first Summer Youth Olympic Games took place in Singapore in 2010. The second edition was held in the Chinese city of Nanjing in 2014.